Ariel, the British car company known for building what look like roll cages on wheels, has just announced details on project HIPERCAR, which, they say, will be a ridiculous 1,180 horsepower, 1,330 lb-ft hybrid sports car that also promises a 0-60 time of 2.4 seconds. Plus, it’s got a turbine range extender on board. HIPERCAR, whose true model name hasn’t yet been decided, is a series hybrid driven by either two or four 295 horsepower, 332 lb-ft electric motors mated to single-speed gearboxes driving the wheels directly. Those motors get power from a 750 volt, 56 kWh (a 42 kWh is also available) lithium ion battery pack. That pack, which is both heated and cooled, is charged by a 35 kW micro-turbine range extender, meaning the car can run off of fuel available at your local gas station. The supercar will come as either a four-wheel drive model producing 1,180 horsepower and 1,327 lb-ft of torque, or as a two-wheel drive model making 590 ponies and 664 lb-ft. All of that moves an aluminum chassis with “aluminium wishbones and outboard adjustable suspension,” along with carbon composite wheels turning 325-section rear tires and 265-section fronts. As for the full reveal, the British sports car company says we should expect to see the finished car in 2019, with production starting in Somerset, England in 2020. 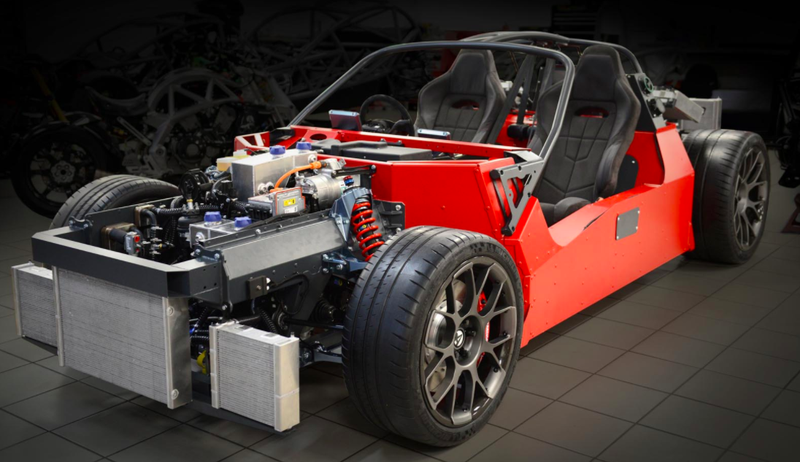 I, for one, am curious how Ariel pulls this project off, because, come on, a ridiculously powerful, lightweight, four-wheel drive hybrid with a turbine engine? That’s the coolest thing I’ve heard all day.